Bringing protection to a whole new level, Alpinestars is delivering customers with a high-tech, lightweight, and incredibly comfortable Alpinestars – A-8 Roost Deflector. This motocross protective gear is designed to be compatible with the Bionic Neck Support that ensures a secure fit when used together. This dirt bike protective gear is engineered to provide superior protection for motocross riders whether you race on the track, or ride through the desert. This Alpinestars – A-8 Roost Deflector is equipped with removable shoulder pads and upper arm guards to fit under your jersey, so showing off your new gear this season will not be a problem. The Alpinestars – A-8 roost Deflector is manufactured with a heavy-duty thermos PU and polypropylene material, an incredibly lightweight mesh, and a soft and comfortable washable Biofoam. Their heavy-duty plastic plates will protect you from roost and rocks, and allows this motocross protective gear to easily conform to your body (view the fit guide on the diagram below to ensure you receive the properly sized Alpinestars – A-8 Roost Deflector). On top of all of that, the Alpinestars – A-8 Roost deflector provides riders with protection across their entire upper body. This dirt bike protective gear is designed to have frontal, lateral, and back, protection and is stabilized with an easy waist fitting buckle. 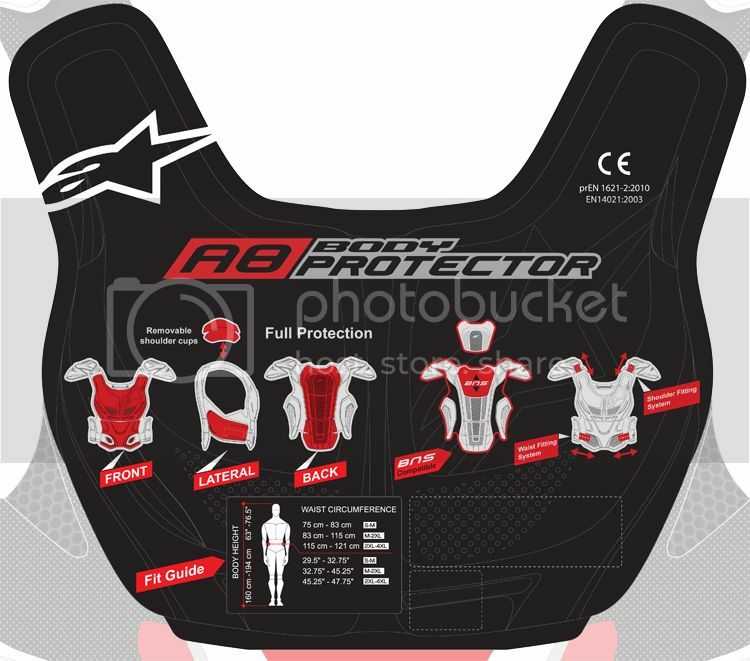 If you are looking for a high quality protective chest protector to ensure you’re safe and properly protected on the bike, the Alpinestars – A-8 roost Deflector is a must buy for you.